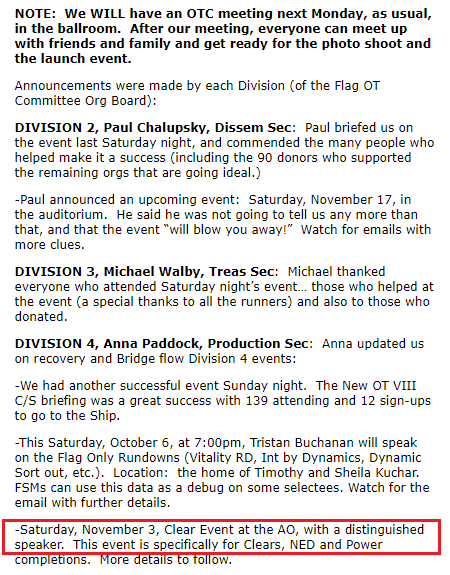 One of our regular, if irregular, features: the often odd, sometimes silly, but always informative and entertaining “minutes” from the Flag OTC. 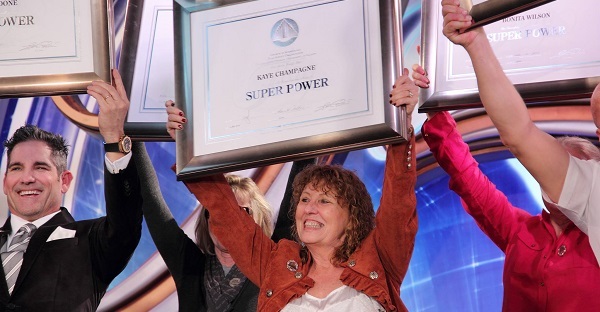 Super Powered Bubbles Champagne and her crew — supposedly the top tier of the scientology public world — are poster children for the bubble-think that is endemic in scientology. They literally see what they are told to see. Period. I have highlighted just a few of the most notable points in their latest edition of “pat ourselves on the back” news. 80 public “recently” routed onto Solo NOTs. Wonder how recently? No specifics is always an indicator that it’s not good. But there are 11 “scheduled to arrive” and 57 more “getting ready to arrive. “ They forgot to mention the 204 who are “thinking about getting ready to plan to start making arrangements to arrive”. i guess it doesn’t occur to them that with these numbers, they are NEVER going to make 10,000. Rooster really got the crowd going with some great stroking at the outset. “Legendary”? Not to be a party-pooper, but you know with the touch of a finger to a cell phone anywhere in the world you can also reach me. So perhaps the balance has definitely shifted in my favor too? Oh, he is still riding on the threat of atomic war? And the great plan that Hubbard had for it? Really? Everyone should move to S Africa? It appears Rooster is still living in the glory days back when things were “hard”. 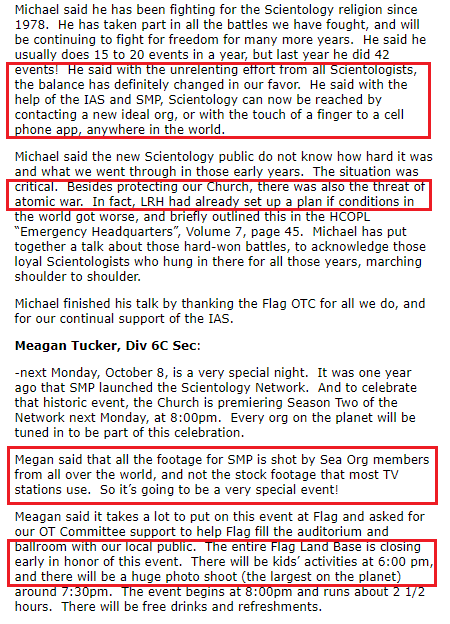 The newbies obviously don’t understand the great sacrifices the heros like Michael, Jeff Pomerantz and Andrik Schapers gave to make it possible for the massive international expansion scientology is experiencing today. Just think – without those brave champions (and your support of the IAS), scientology would not have been shrinking at an even faster rate than it is! They’re closing down the entire Flag Landbase for this watershed, epic event. You can bet the ONLY people watching this “launch” will be the people who are suckered into going into an org to watch it. That’s all the amazing information there is for this week. I am sure readers will note other items of interest. I’m having trouble commenting. Anyone else? I’ll try again later. Mike, the OT lives in Fantasy Land. The old days were like a walk in the park compared to the reputation Scientology has now. It now has earned the bonified status as one of the most fraudulent and toxic cults on the planet. Yes Michael, great strides have been made thanks to your tireless efforts to collect your commissions from all the duped donors to the IAS. SAD what they have to do to make themselves feel good about the make-work they’ve been assigned. “thinking about getting ready to plan to start making arrangements to arrive”. Comedy gold there Mr. Rinder. If we look at Hubbard’s master plan, why it’s sell books to the public, and advertise selling books to the public, first they can join via a scientology mission, and from the beginning it was called dianetics group. So the plan is to get people interested thru book sales, Jefferson Hawkins did that and created a books make booms. LOL as he did it. That’s why I’m LOL at DM. But, the bottom line is, really is, reading Dianetics makes you think you can go “clear”, why only two people reading that book can go “clear” if you follow the procedures in the book.. In the end, no clears or OT’s, it’s really much ado about nothing. For nobody who has done dianetics has perfect recall, or cured cancer, or has etc etc. Same with Scientology. Heavily Soiled Garbage Bins and Food-Grade Containers! Hope this works….change a few names & words around as to “Who’s GOT the Power”….Who’s going to break your heart, break your spirit, break up your family, break you bank account….. The report mentions Tristan Buchanan. My god, he is still on staff! A second-generation Scientologist, he must have been on staff at the FSO for at least 28 years. I have to wonder…all outer org staff have accessibility to tv (ie. Aftermath) internet (all the blogs) and they must be sick to death of stat pushes…how many secretly watch this somehow somewhere. I know I would have. Their flag stats are just sad compared to 78-82 where hundreds daily were on those levels. I too shudder at the thought if I still had to be doing what these people do daily. I do believe they are well intentioned overall…or at least I would be if I was still there so I’m judging on that. They are still holding up their umbrellas in gale force winds. Only the tigers survive? They have no other friends or family? They didn’t finished HS and don’t want to flip burgers? They are otherwise comfortable, why rock the boat? CC, without a high school diploma even McDonalds’s couldn’t hire them. Flipping burgers would be a goal for many of them. That’s curious: LRH had a plan to protect the “church” from the wog world’s threats. And yet, he did NOTHING to protect his own WIFE from going to wog prison–to save his own hide! And these folks seriously believe that Elron would have lifted a finger for them? Since when? We got closer to nuclear war in the past two years with the ego-off between Trump and Kim Jong Un than we were in the whole rest of my adult life. And yeah, moving to South Africa would be no solution. I’m anxiously awaiting the “now it can be told” stories about how LRH had secret talks with world leaders and stopped World War III from happening. Oh, man!!! I’m sitting on pins & needles waiting for this. I’d tell my wife, but she thinks Scientology is silly. Her loss. I once had super powers, too; the power of arrest. I was given a diploma from the police academy, too. Just think, or not, it’s up to you, I could’ve used the same energy in SeaOrg or trying to cross the bridge that’s talked up so often. Today, I’m just an SP living in the NH woods, I’m sad to say. Living in the NH woods sounds wonderful to me, jburtis. But, keep in mind you used your Super Powers by getting up and walking away. Congrats!!! I’m wondering how the minutes to their oh so secret meetings end up here….is there a mole? It must freak them out something awful when they see stuff like that here….they are all looking at each other and wondering who the leak is……that must add to their ever-growing paranoia……Awesome!!! I was thinking the same thing – it must be unnerving to have a “traitor” in their midst. Boy! I yawnalot on this stuff. I’ve been to Flag many times until the light globe finally came on and my opinion now is that being in a dentist’s waiting room anticipating a root canal is far more enjoyable. Lot cheaper too and you actually get service & something useful for your money. I had a root canal done done after getting hit in the mouth with a baseball bat, in elementary school. I can still recall the pain. Vividly. Move to the beginning of incident & tell me when you’re there. What is the duration… opps old habits die hard. Have 3 tokes, a couple of glasses of melot, Write an obscene comment or two about Scientology and see me at the pub on Saturday. There, that’s a better tek hey? 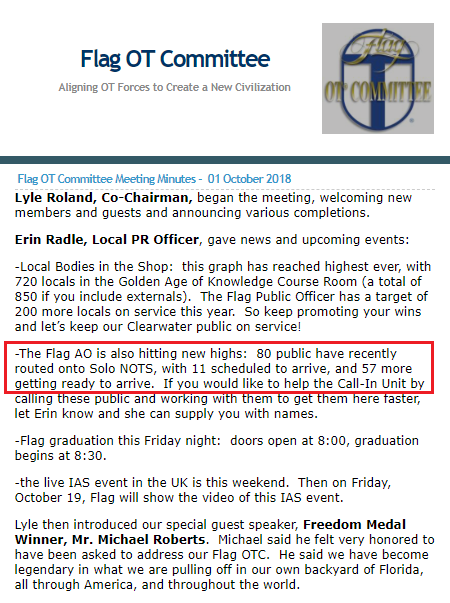 Is Flag closing at 6 pm so Sea Org members can change into normal street clothes to make it appear there are more ”public” on services at Flag? Abracadabra! What’s with these “largest on the planet” photo shoots? Compared to what? Buddhist photo shoots? Hindu photo shoots? Huge and adoring crowds come out anywhere the Pope shows up (and there’s plenty photo documentation of that). The Dalai Lama draws pretty good numbers and gets world news coverage. But the pope of Scientology doesn’t dare show his face in a truly public setting. He’s ecclesiastically detested. These photos will again prove…how small, shrinking and unable Scientology has become. “Largest photo shoot on the planet!”. Corner Cottage I was thinking the same thing. Really? The largest? Give me a break. Lol. That’s scamology for ya! OT but not really. Yesterday I was working with my assistant on gathering information for a “letter terminating representation.”. At our business, this is not a bad thing, but something we strive for. A client comes to us and asks for help fixing something, we sign an agreement with them as to what we will fix, we fix it for a set fee or hourly fee, based on the problem, then we terminate our relationship with them. It is in the contract that if the client doesn’t provide us the information we need, the cost of fixing it falls on them, if they provide us what we need and we do not fix it correctly, the burden is on us to fix it no charge. When we fulfill our commitment, we thank them for choosing us and let them know our representation is complete. We have fixed things at our cost several times, we have charged clients other times. We explain why we charge them when we do. If they have another problem, they may come back, if they wish, or they may go elsewhere. If they go elsewhere, we do not badmouth them, but provide the new firm with the information they need. Contrast that to scientology. If those of you who were in can remember, think of why you started. What was your “ruin” that sucked you in? Was that ruin ever addressed? Did you keep hoping it would be addressed on the next level and hang around because of that? Even those of you who claim “scientology helped me”: Was your ruin ever addressed? I’m not trying to be rude here. I really want to know. Anyone who makes a promise in “the real world” is held accountable for their promises. Scientology, on the other hand, uses the legal system to destroy those who try to hold them accountable for their promises. Perfectly said Valerie! Too bad they don’t play by the rules of the real world. DM is way too arrogant. Also I read Dianetics when I was 18. When my friends asked me what I thought I said, “Well it’s interesting but it’s definitely not a religion! It was so obvious to me even then and I had no preconceived notions whatsoever. 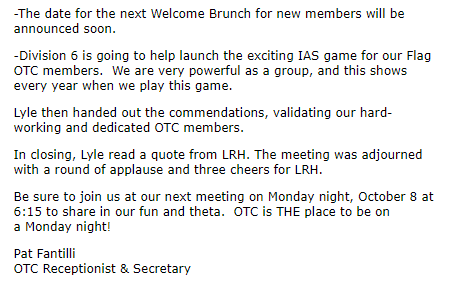 These OTC minutes look like evidence that the remaining Scios are the least brightest people the COS has ever had. I’ve observed over the years that the smart ones were the first to bail out. Then there were the fairly smart ones but were slow learners (like me). Eventually all that was left were the mentally dull, emotionally damaged, and twisted moonbat true believers. It’s just a crazy-assed theory, but it’s my crazy-assed theory, and I’m sticking to it. I, too, get the impression that the still-ins, and the few who have joined up more recently, are not the sharpest knives in the drawer. One indication of this is the atrocious grammar and generall poor English skills seen in the various flyers, broadside letters and posters. Another are the occaional encounters on line at this website and others with the practicising scions who sometimes drop in. They don’t strike me as serious thinkers, to say the least. Exhibit A: Tom Cruise; great actor for the type of movies he makes, but certainly not a deep thinker; more of an idiot savant, actually, when it comes to film acting. Lots of foreign people for whom English is not their native language also explains the poor English skills. Also: study tech does not work. Okay, I can understand someone speaking English as a second language not having great writing skills – but to let the grammar mistakes go out the door on posters and other notices, where the public can see them? I mean, who’s minding the store here? Of course, if the overseers also have atrocious English skills (due to poor education, most likely) they’re not going to notice the mistakes. I think what appeals to a lot of “still-ins” is the fact that if you don’t have a H.S. dipolma or any college is almost considered a plus, and of course a minus in the outside world if they leave. education you could get. I had several staff members tell me this when I was on staff. Cue “Twilight Zone” main theme. Yes, provided they’re due to having donated too much of one’s money, time or effort to the cult , along with bankruptcy, bad credit and insolvency in genera – l lack of education, rejecting being trained in any decent paying field, rejecting college and other higher education, and ignorance in general are all REWARDED by cult. Operating states which put a young person at high risk for turning criminal, for becoming addicted to drugs both street and pharmaceutical, for becoming dependent upon welfare or unemployment insurance, or, at best, their families, for life: operating states which make an individual highly susceptible to mental depression and physical illness, and last but not least, operating states which are highly conducive to a young person never being able to start his or her own family – these are ALL operating states which Scientology APPLAUDS. This cult loves nothing more than turning an “upstat” into a TOTAL “downstat” via the relentless extraction of money, effort and time from the upstat. This cult will drain you dry. It will drain from you everything that you have and all that you hold dear in its relentless quest for every bit of free money, free effort and free time it can get out of you. And once you are drained dry – OR Xenu Forbid! you put your foot down and say “NO MORE! – well, you’re worthless to them from that point on, and you are disposed of “quietly and without sorrow”. Current and former $cilons are very susceptible to falling into the trap of a permanent solution to temporary problems. Yes, suicide. The young ones are in that “most likely to” demographic.. No wonder they cling to the cult despite being exploited. They need the validation. With few exceptions, no one on the outside is going to be impressed with them. I know a number of these 20 somethings, 30 somethings, pushing 40 somethings and 50 somethings. I’ve checked out their Linkedin profiles and other places where they promote themselves. Not one of them – not ONE of them – mentions being on staff at a Church of Scientology, or having been on staff. And some of them were once or have been on staff for DECADES. Not a whisper about it. It can be assumed they’re not proud of this, More to the point, it can be assumed they know quite well that linking themselves to Scientology will not help them get them a job or sell their little doohickeys online. Yes, Kyle. I came close to self-termination several times in the SO. Suicide is not a.permament solution either. Glad to see I’m finally getting some respect around here, Bill! You should, Chris, because it’s the truth. Chris Shugart I’m on board with that theory! Yeah, what Nero said X2. Largest photo shoot on the planet. Wow. Just. Wow. Makes you go all misty & short of breath doesn’t it? I’m short of breath but only because I’m holding it waiting to see the spin when they have so few bodies in the largest photo shoo on the planet. Not sure about Ned. I think he was responsible for the bars on the windows at Int and the razor wire contractor guy RB interviewed said it was Ned who insisted on the wire facing inward. Maybe Ned is being groomed for Karin’s position? That Ned is a bad bad boy. Around the year 2000 I was doing QM duty on the g angway of the Freewinds when I saw that the setup had been turned around so that the QM faced into the ship instead of out. This was clearly done to keep people from escaping. This did not last long. It was too obvious. No ship’s QM faces inward. Yeah I know, but don’t waste good food. all while calling themselves a religion and hiding behind the religious cloak! Stat I agree with ya 100%. Except……”Big” Bubbles Cham-plain and Grant “Slick Willy” Car-Bone know EXACTLY what and who they are in bed with. I agree, Karma and Stat. Bubbles and that little plug-ugly Cardone know EXACTLY the fraud being perpetrated, the con job they;re are supporting. Innocent? Duped? Forget it! They are Miscavige’s Flying Monkeys.who know exactly what they are doing and just as criminal as he is. “…ARE just as criminal as he is.” Sorry, somehow have to get this continual in and out loss of internet issue fixed. I don’t edit because I’m afraid of losing it! Kaye Champagne, Division 4A the International Division???? What is that…International Division! 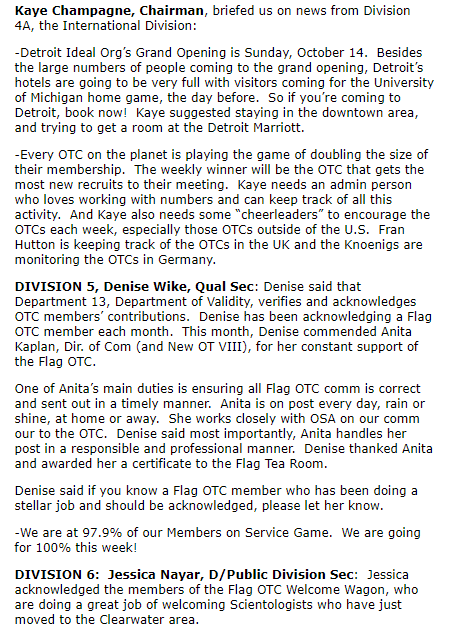 And what about the Cheerleaders Kay needs to ‘encourage’ OTC Members? Are they hard to get them to work for the stats? And poor Michael Roberts, he must be exhausted with 15-20 events year! Poor guy, he needs a break. Michael Roberts – another criminal. Flag’s epic production, fabulous mountains of stats, conquering the world! I remember being impressed and envious of Flag stats. I’d like to pink sheet the entire mob of still-ins. Do it as a group pink sheet. Every org is to call in all public, the public and staff get together and group clay demo the Instruct. Then when the “cognition” occurs, they can all head out and hit the local bar and form something fun and worthwhile… perhaps a dart tournament. Scientology is composed basically of 2 groups: 1) people who have been betrayed and know it; and 2) people that are being betrayed but don’t know it…. yet. The former is the largest group and growing. The later is a smaller group and shrinking. 25 years down the road the church of scientology will be presented in a completely different form. And very small. Bravo Robert A. What you said makes a lot of sense. And the first group (hopefully) is largely UTR. I personally know 2 UTR Scientology families. They know I’m out. We don’t discuss Scientology at all, via silent agreement. Someday, I’m hoping Maurice Garfield quits, and then gives a decades long debrief of the course rooms at Flag over the last couple decades. Last I knew (10 years ago) Maurice was a NOTs Auditor and had been for quite some time. Thanks for the info on Maurice Garfield being a NOTs Auditor for 10 years now. Two of the most repulsive people in scientology in the header picture – Kay Bubbles and Grant Cardone. I can only imagine the calls going out to get public in to watch the New Season Premier. In or out that is going to be ONE BORING EVENT. So glad I’m OUT. I forgive much, but there are a handful of folks I truly hope never get out. Befitting punishment. 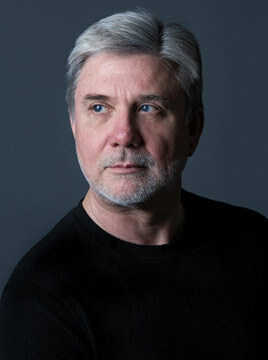 People like Mike Rinder? He was a piece of work when he was in, but once he got out, his natural sweetness and humanity came back. Maybe some of those other guys are really nice inside, too? That’s a good point, pucklady. A very good point, actually. And I know that yours is the right attitude too. Your viewpoint is the correct viewpoint to hold, about the Still Ins. So, given this viewpoint, what makes some leave and some stay? Perhaps its a question of how much undeserved punishment and abuse each individual can keep taking and observing others taking, and justifying it as deserved. Perhaps its a question of how many lies and scams a still in can stomach supporting and perpetrating before reaching his or her limit and saying, “No more. This is insane. No more.” And leaving. For me, it was what LRH called “A held down 7”. It was the datum that one could not leave the SO alive. So, of one is not ready to die just yet, one has to just keep going. With a billion year contract, anone who fails to show for muster 10 million years into their contract is a deserter and a freeloader. Fortunately for me, a meat body does not last that long, especially with little rest. I can understand that, Bill. Countless people have died for what they believe in. Glad you didn’t 🙂 Though when you DID believe, you probably would have given your life to help the cause. They should arrive around 2093. I heard it was being coordinated with the release of passenger flights to the moon. I think I also heard they’re putting a Denny’s up there for the economy class plus an Irish Pub. The pub was vetoed by TC though, he doesn’t like dogs! TC doesn’t like dogs? Jeesh, even DM likes dogs. Even Hitler liked dogs. I used to hum “Deutschhund uber Alles” on the Freewinds but it freaked out former Chief Electrician. Mike Sanders. Herr Sanders was in the German Navy and the tune was banned in Deutschland after the war. And a big hip hip hurrah for our Dear Leader for the soon to be 57x shrinkage. Re: accurate representation of facts. HOW DARE YOU MISREPRESENT THE ALL HOLY STATISTICS OF THE CHURCH OF SCIENTOLOGY! THAT STATEMENT SHOULD SAY 57X EXPANSION! IF YOU DON’T CORRECT THAT RIGHT NOW I WILL COME DOWN ON YOU LIKE A FLAMING ASTEROID! Come and listen to my story about a guy named Dave. Snotty kid from Philly, never ever had to shave!